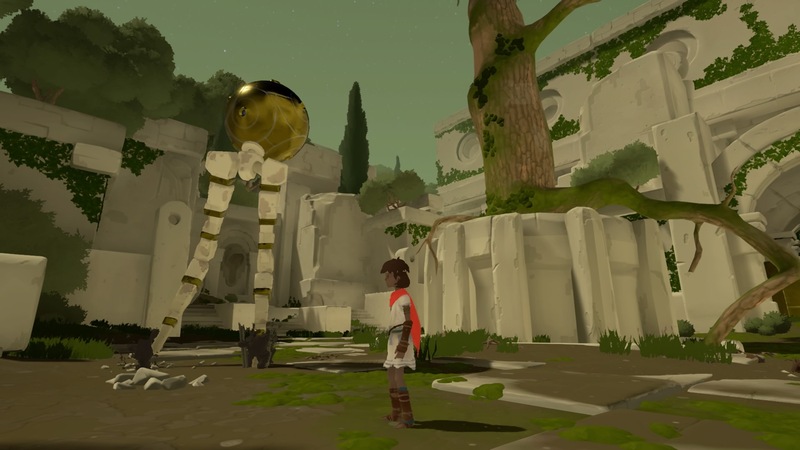 The longest chapter of RiME yet makes things confusing with tons of brain-twisting challenges. 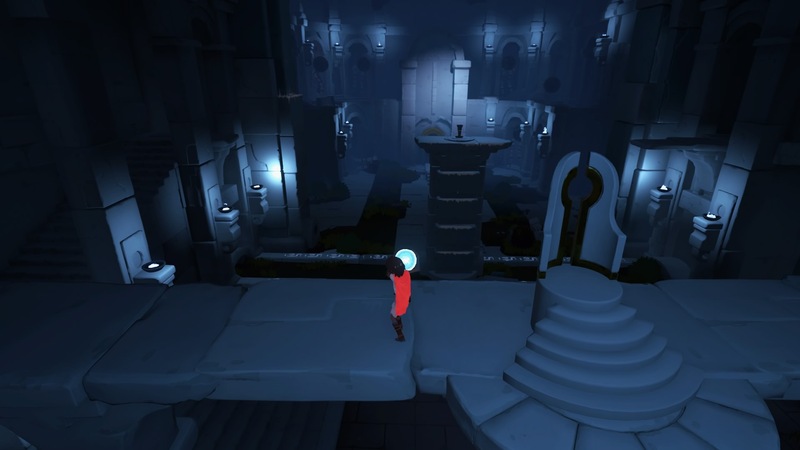 See how to overcome every puzzle room with this step-by-step guide for Chapter 3: Bargaining. Chapter 3 begins with a giant chamber of doors that transport the boy to locations that make no logical sense. And the situations only get weirder from there. 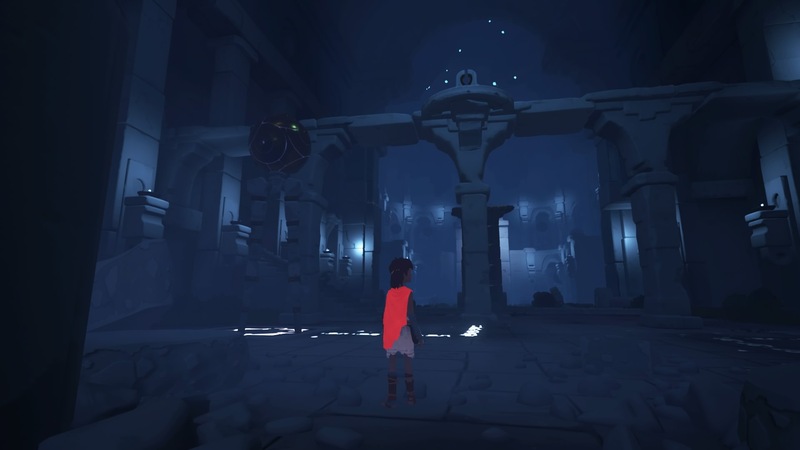 As you travel into the temple, you'll encounter strange walking contraptions, dangerous shadows, and weapons to fight against the dark. There's a lot to soak in during Chapter 3. 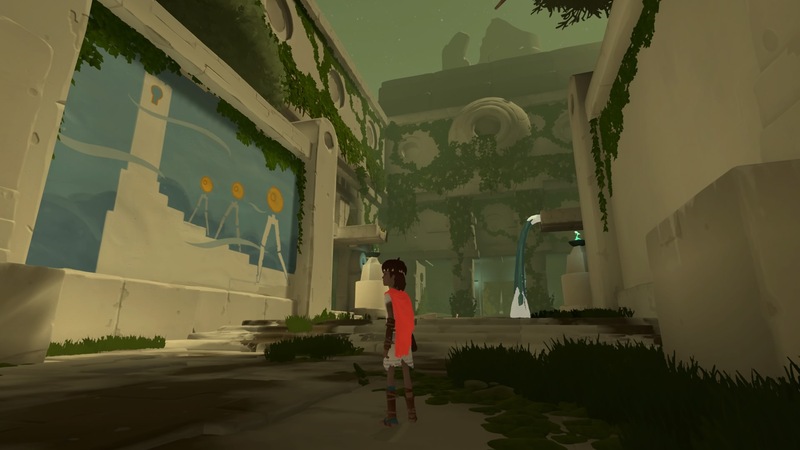 Get a helping hand with all the puzzle solutions in our walkthrough below, or use the gallery for a guiding tour through this beautiful location. The kid wakes up in a chamber full of identical doors and pathways. It doesn't matter which doors you use - they'll always lead back to the massive central chamber. 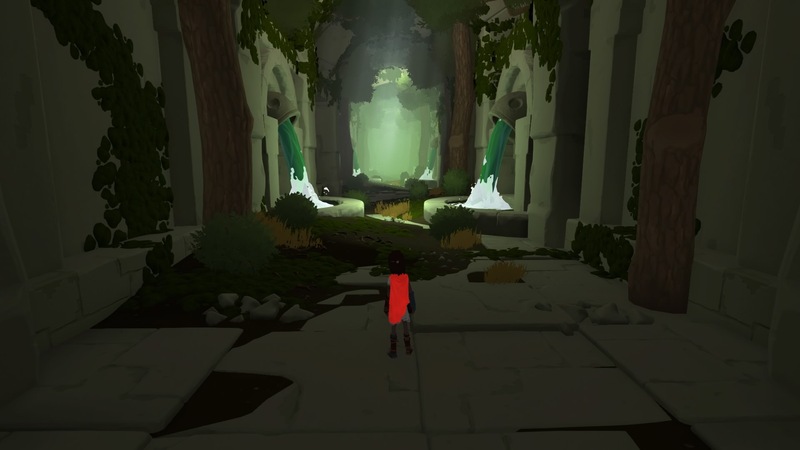 Go through three doors, and you'll appear in an endless hallway filled with fountains. 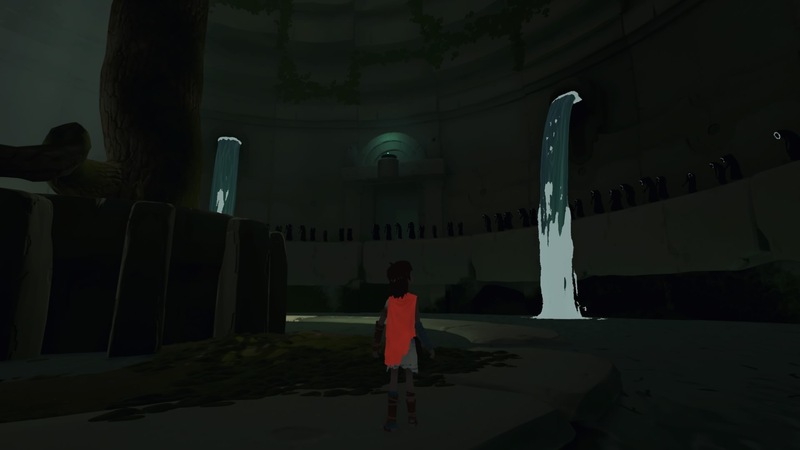 In the fountain hallway, run forward for a short time, then turn around. 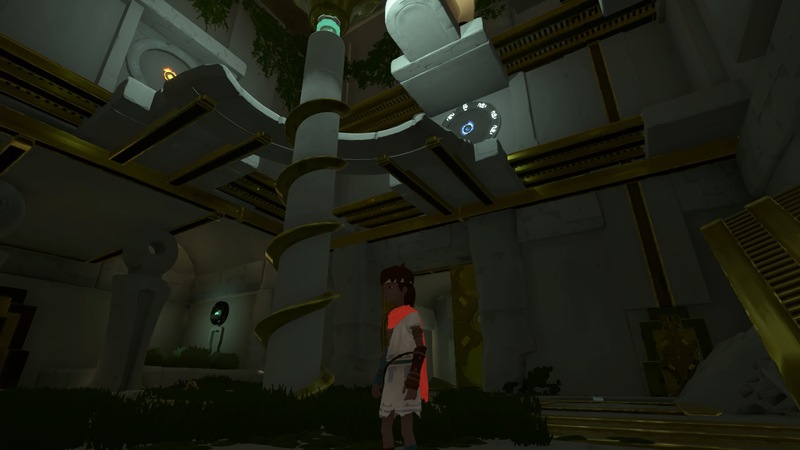 This chapter is full of strange geometry and trickery, so be prepared to explore. 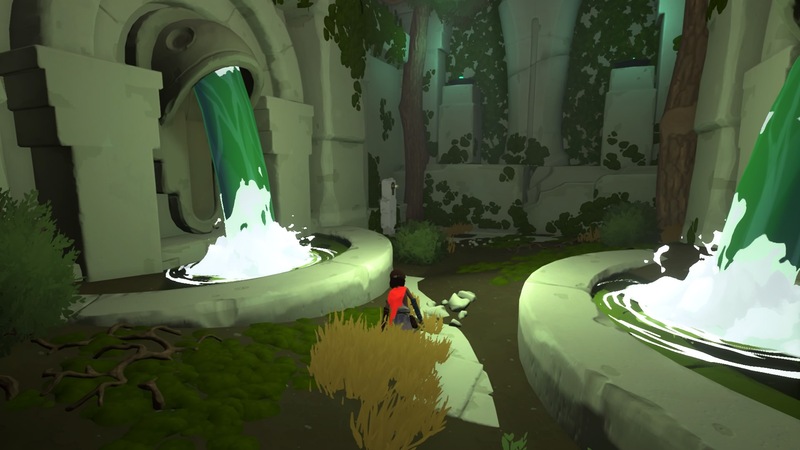 In the fountain hallway, you'll find a wall will appear when you turn around the first time; turn around again to find a statue room, then swim in the fountain (behind the statue) and follow the waterways, using the bubbles to lead you. In a dark chamber, you'll encounter a new problem - shades. 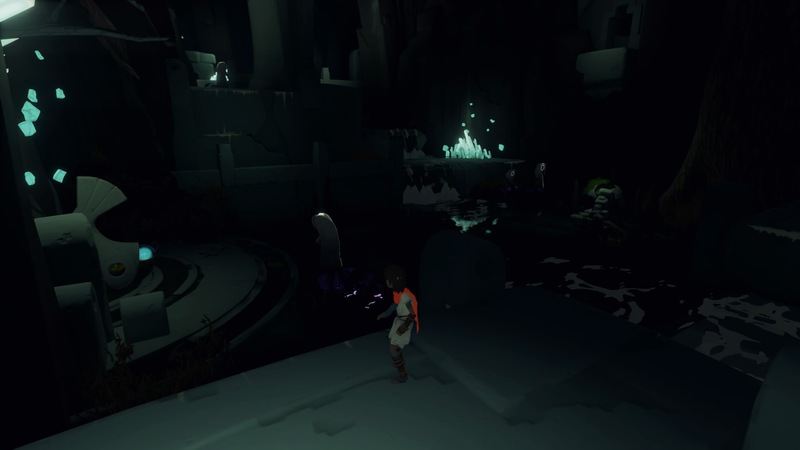 These creatures won't run away like the ones in Chapter 2. You'll have to drive them off, and you can use light to do it. Use the fallen tree to reach the turntable and push it to redirect the light onto the shades. 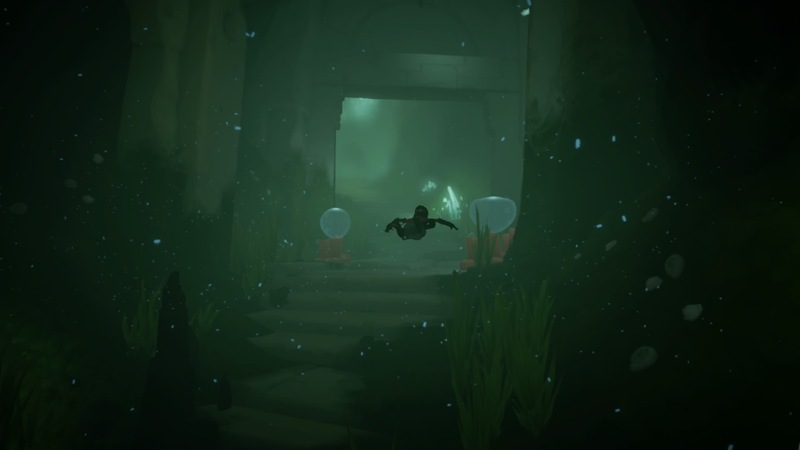 With the shades gone, you can now enter the next room and dive underwater. Follow the water bubbles and swim to the surface. The mysterious room is full of watching shades, but let's ignore them for now. In the fountain room, follow the fox right and use the white chalk-marked ledges to get through the debris. 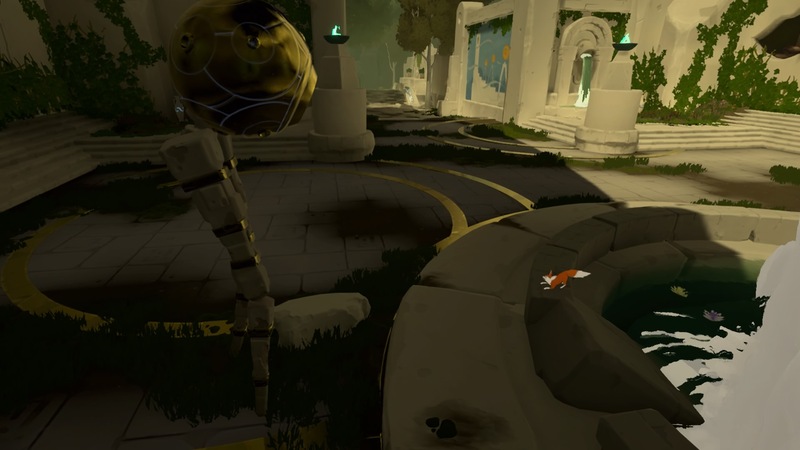 Past the debris, the fox will lead you to a strange ancient glowing blue orb. Grab it and take it to the moon marker - shout, and the orb will explode with light! When the moon marker becomes a sun marker, the exit door will open. 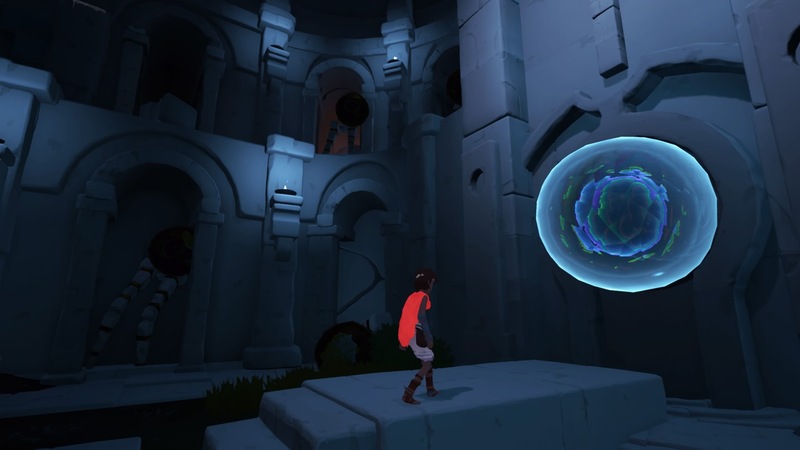 You don't have much time, so carry the ancient orb close to the door, then shout and run through the exit while it's still open. Through the door, take the ancient orb and place it on the pedestal, then enter the doorway with your barking fox friend. 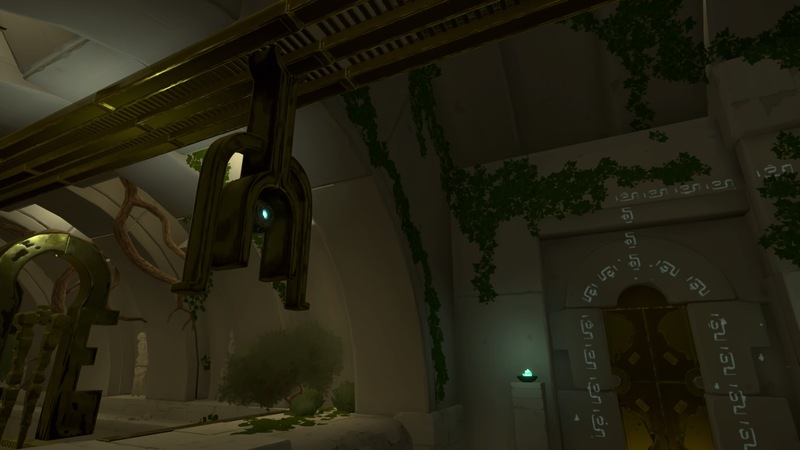 Down below, you'll find a room filled with sparking ancient machines. 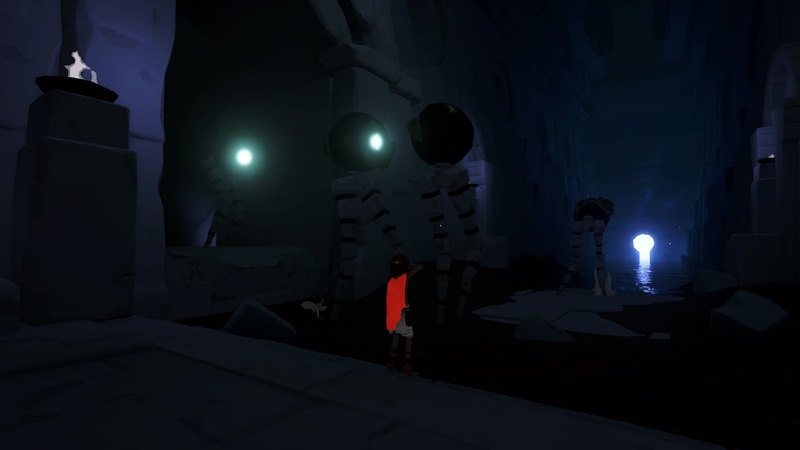 Grab the light orb from the generator on the right, and use it on the strange set of mechanical legs blocking your path in the foggy hallway. Shout to activate the light orb, and the burst of sunlight will in turn activate the machine. 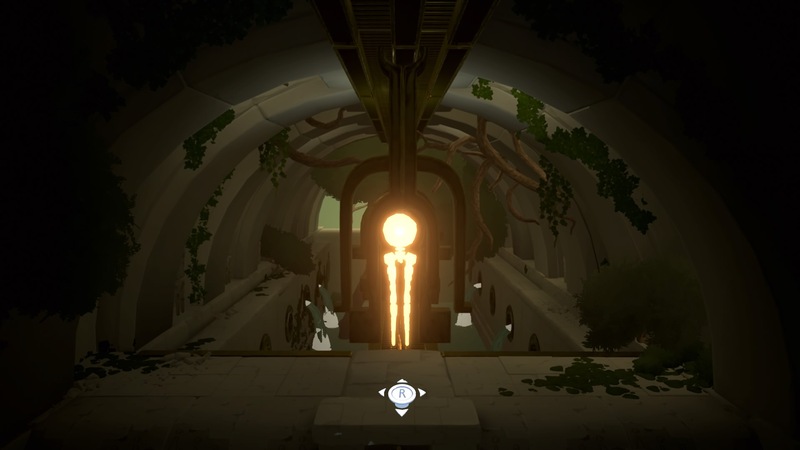 Grab a second light orb from the generator (it will infinitely spawn more orbs as they're used up) and activate a sunburst near the giant pile of derelict bots. Using the sunburst revived one of the robots! He'll help you, so follow him back to the chamber up the stairs. Up the stairs, he'll send you a message - he needs your help. 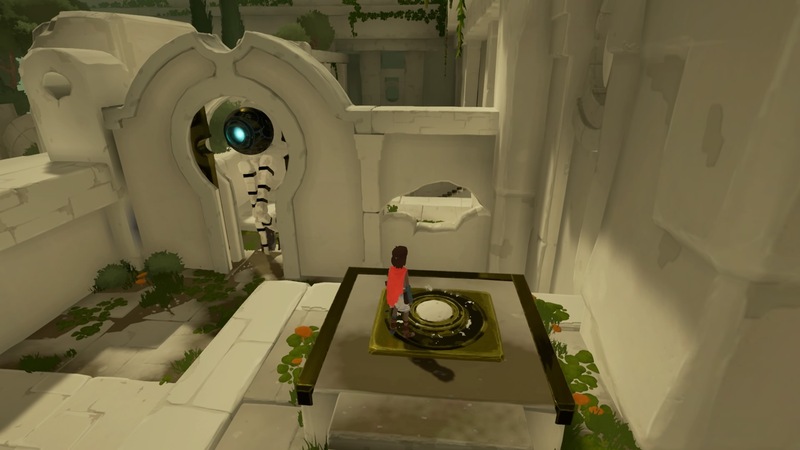 You'll need one of these robots to finish the puzzle and escape the Chapter, so there's only one way to go now. Enter the doorway that the walker kicked down to reach a new cave chamber filled with shades. These won't sit around passively - they actively chase the kid! Rush to the far end, go up the steps, and reach the corner to the left of the exit door guarded by a swarm of shades. There's a light orb generator here. 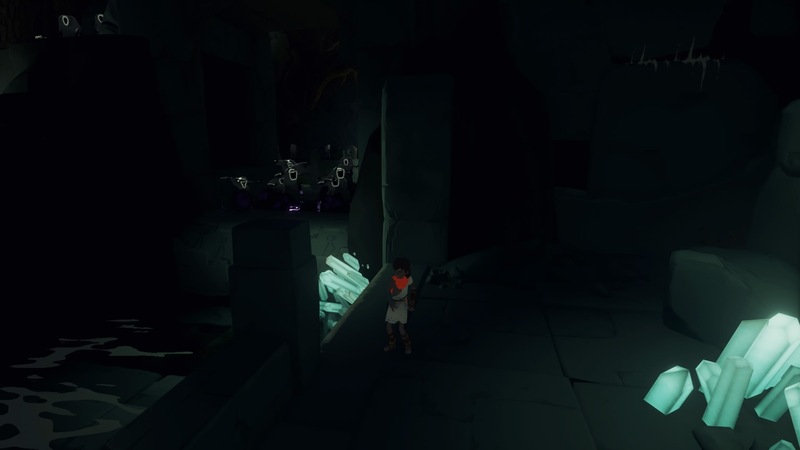 Take an orb and activate it near the shade swarm to clear the path through the door. Don't get too close, or they will attack. 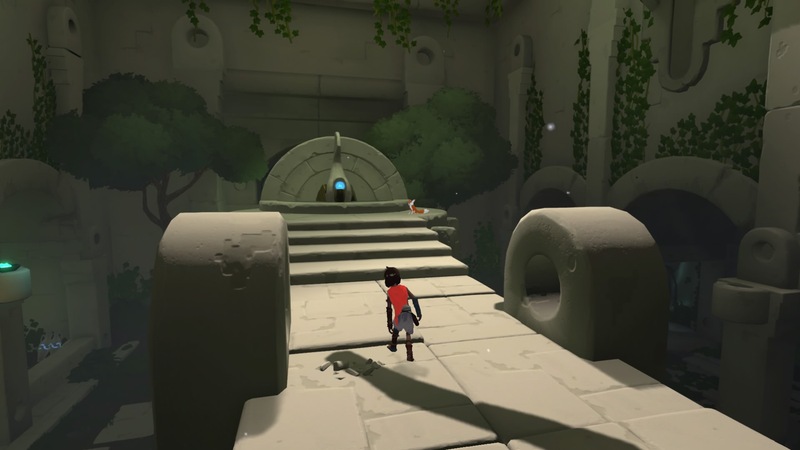 In the waterfall passage, you'll need to lure the shade away from the generator, then grab an orb and use it on the pair of shades on the right, guarding a white chalk-marked ledge the boy can use to climb up. Continuing on, there's a shade right in your path. Just run by him, you'll be able to survive and reach the generator. Unfortunately, the light orbs aren't enough to get rid of the shades blocking the exit. Use the white chalk-marked ledges to climb up and over, then drop down to escape. 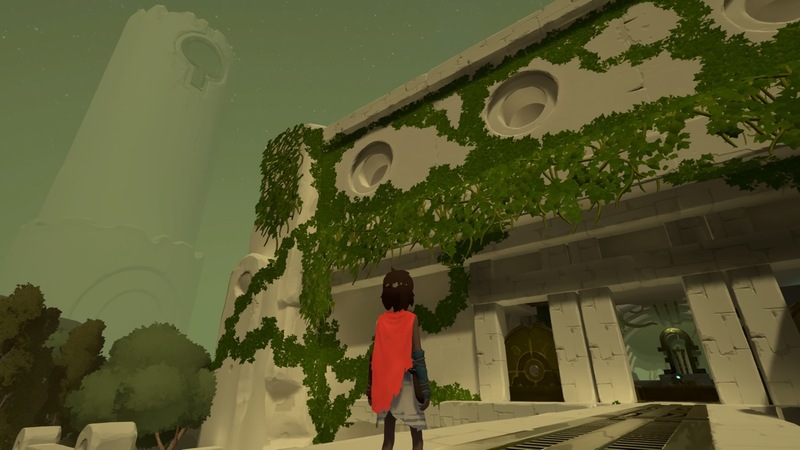 Go up the stairs on the left and enter the huge gold doors (your fox pal is barking to lead you there) to reach your first real puzzle. 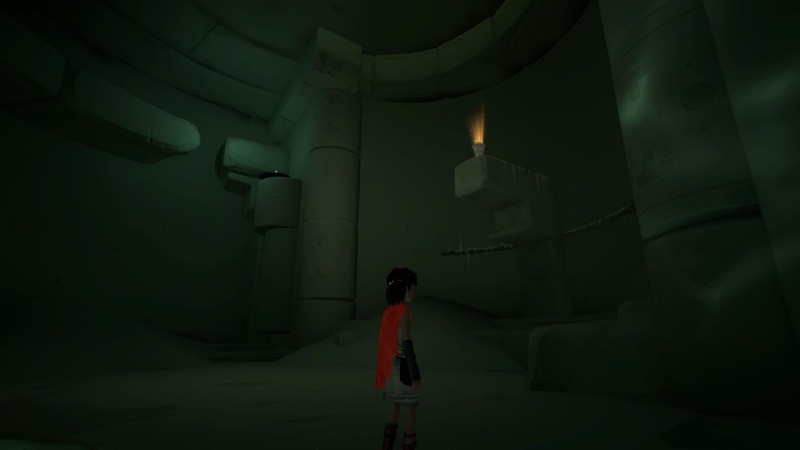 The first major puzzle of the chapter is located ahead. 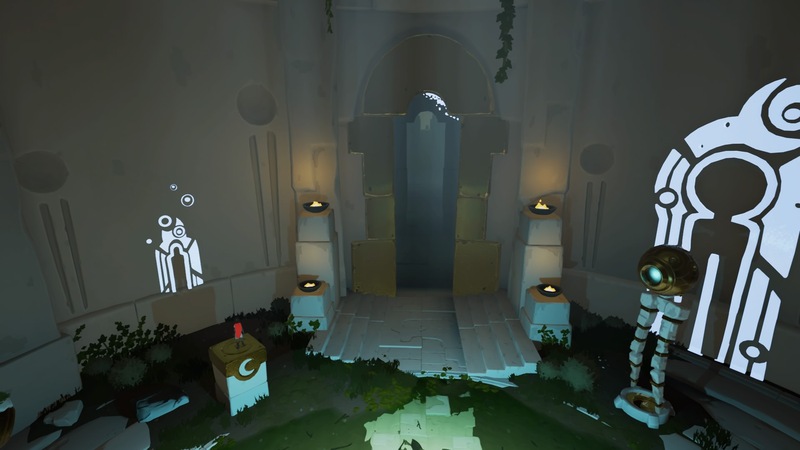 In this massive, golden chamber, you'll need to collect a key to progress. To make things easier, I will define the doors like this - the entrance door is south, the doors opposite the entrance are north, and the left / right doors are west and east respectively. 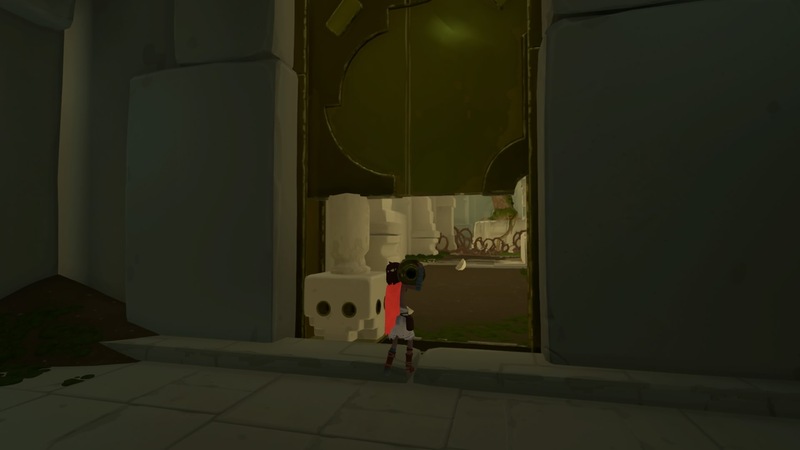 The West Key: Just as you enter, turn left and enter the small room with the bowl-headed soul statue. Shout to activate it - the room is actually a lift, and takes the boy up to the second floor. 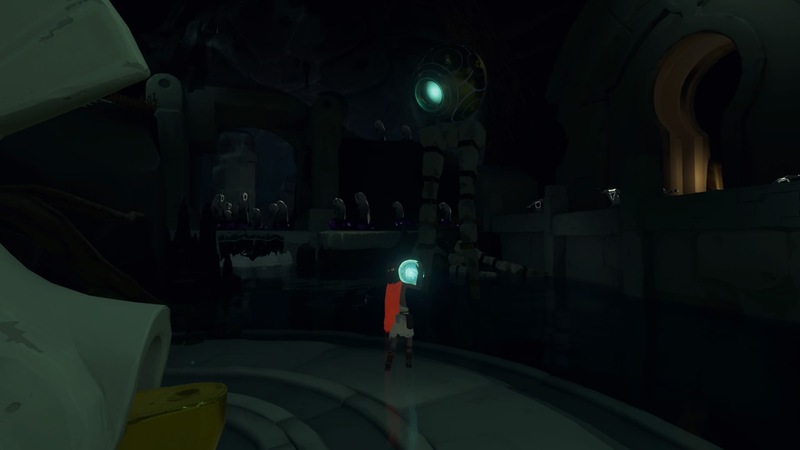 Up above, there's a large gold device with a spinner soul statue. 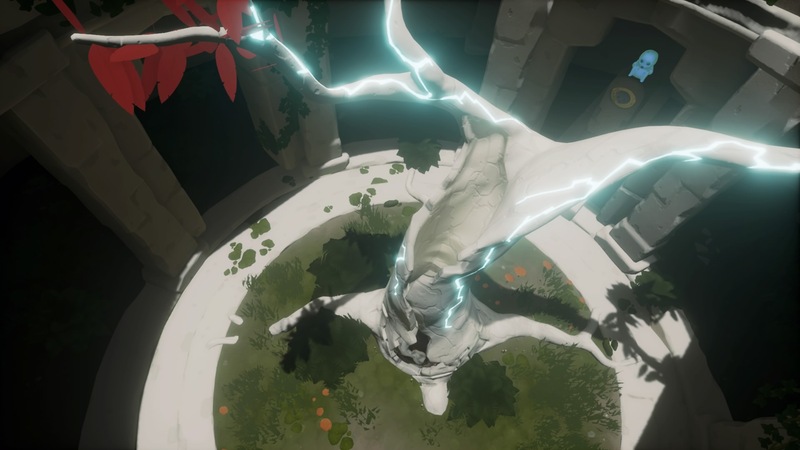 Shout so the spinner soul statue faces the door, activating it - the first key is inside. 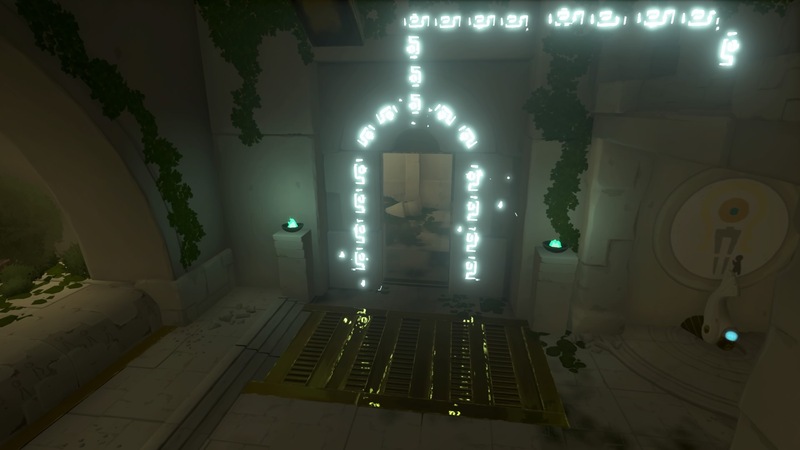 The key is used on the first floor of the puzzle room, through the north door. 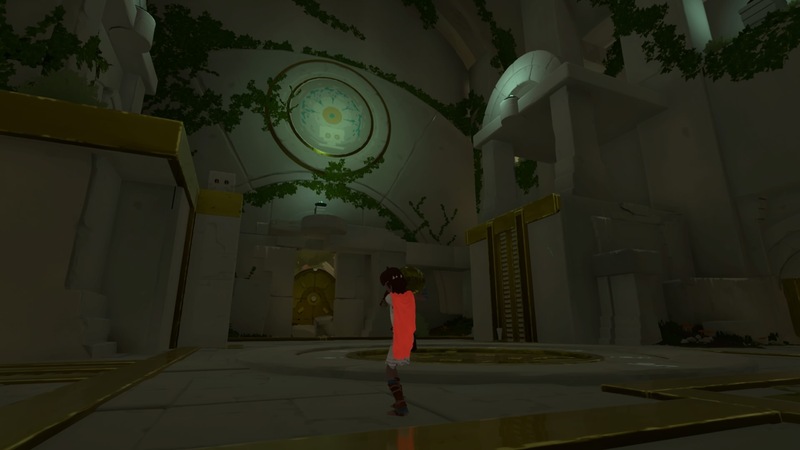 Return to the second floor puzzle room, and shout to enter the 2F north door. Up top, turn the turntable to open the sundoor above and drive away the shades. Now you can use that key! 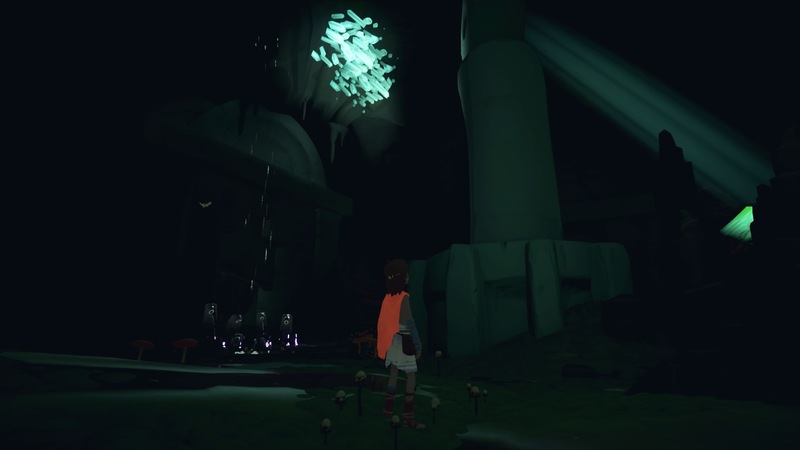 Go to the first floor (north room) and use the key, then shout at the soul statue behind the white tree, opening a water sluice to revitalize the tree. 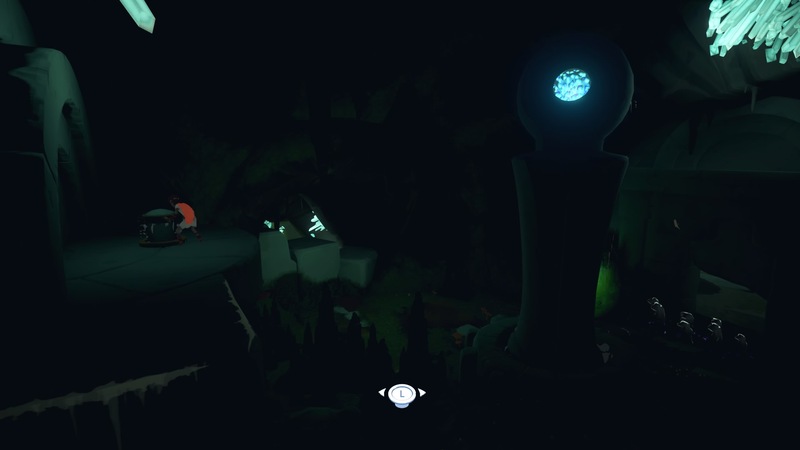 Now you can grab the glowing core from the bot stuck in the tree. Take the core and place it on the pedestal through the 1F east door. The door will open, but we can't leave the core behind. 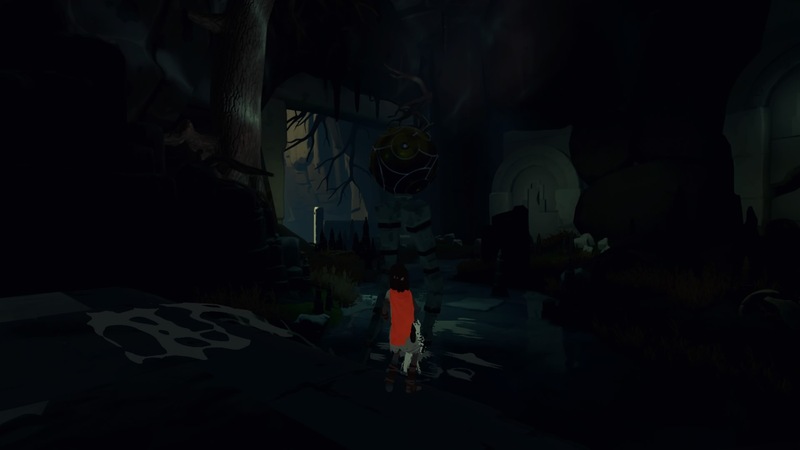 There's a statue on a movable block in the passage ahead. Grab it and place it in the doorway. Now you can take your core with you! 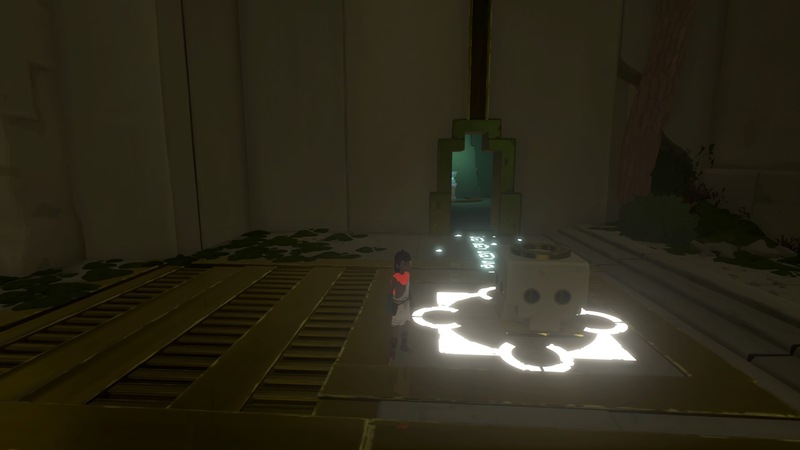 The statue will block up the door as it closes. Place it on the pedestal up the steps on the right to close the doors and smash the brambles blocking the kid's path. 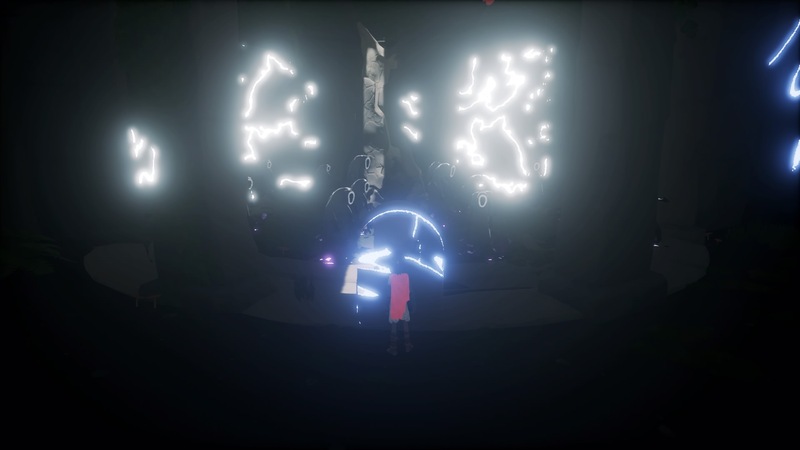 Continuing on and into a new massive chamber, place the core on the pedestal (on the right) to activate a lift to a keyhole device. 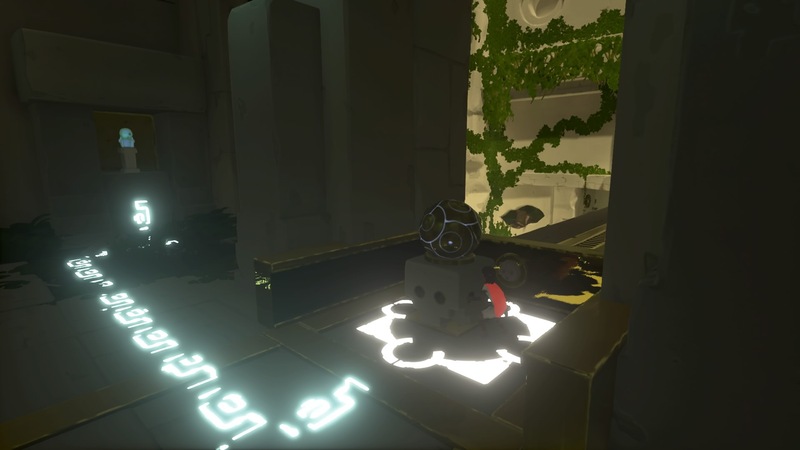 Use the keyhole device and align the glowing circles to transfer the core to the movable block on the opposite side of the room. The core has grown, and is now embedded in a movable block. Drag the block onto the emblem floor (in a gold square) behind the circle in the center of the chamber. The emblem will light up, causing a massive orb to appear. Shout to shatter the orb, transferring the light to your little core device - it's come to life! Place the (now living!) core onto the emblem in the small walled-booth. 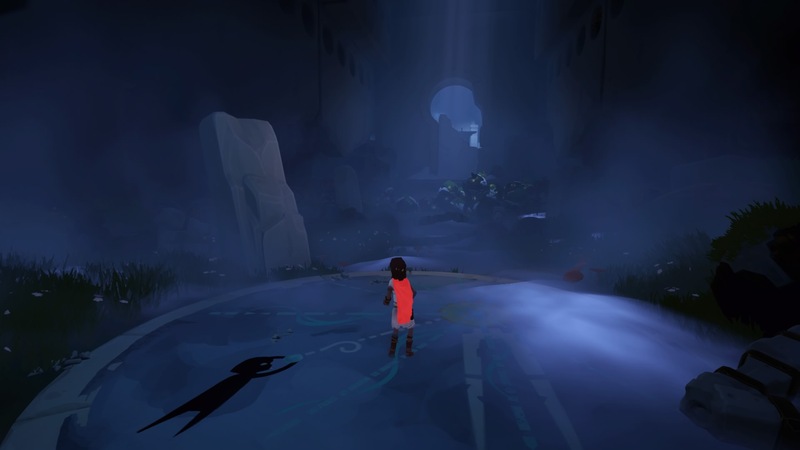 The emblem will glow and create a path to a soul statue to the left. 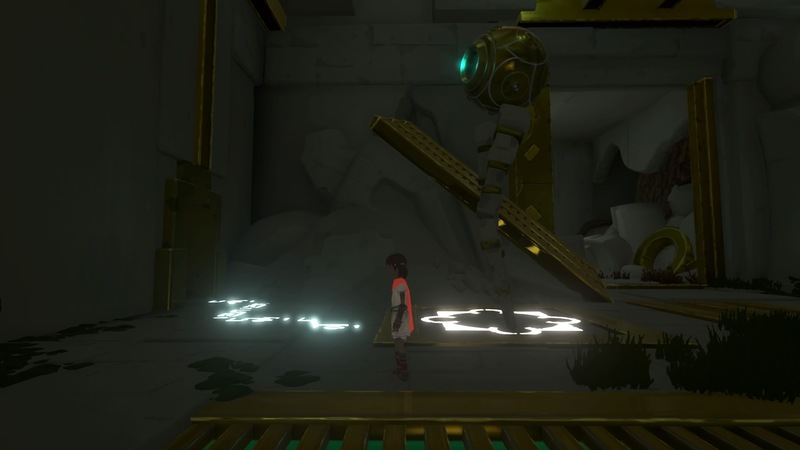 Activate the revealed soul statue to transport the core block across the bridge. Follow that core! 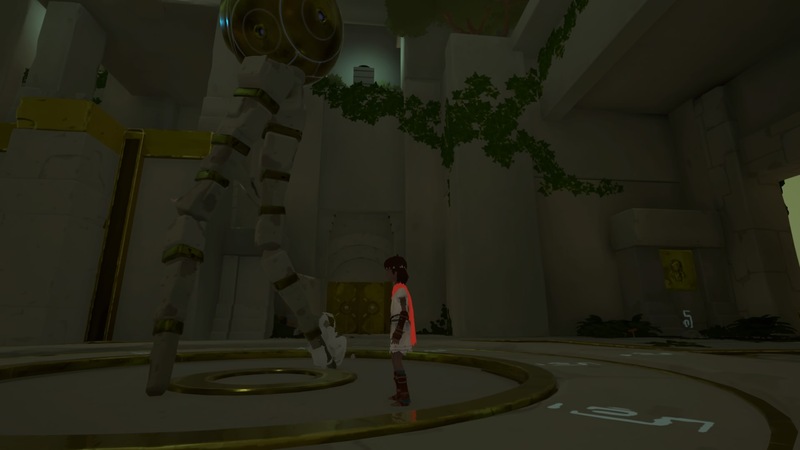 In the next room, push the core block onto the central emblem to reveal a soul statue. Shout to activate it, move the core to a crane and suspending it over the chamber. To open the door to the left, move the block onto the left emblem. 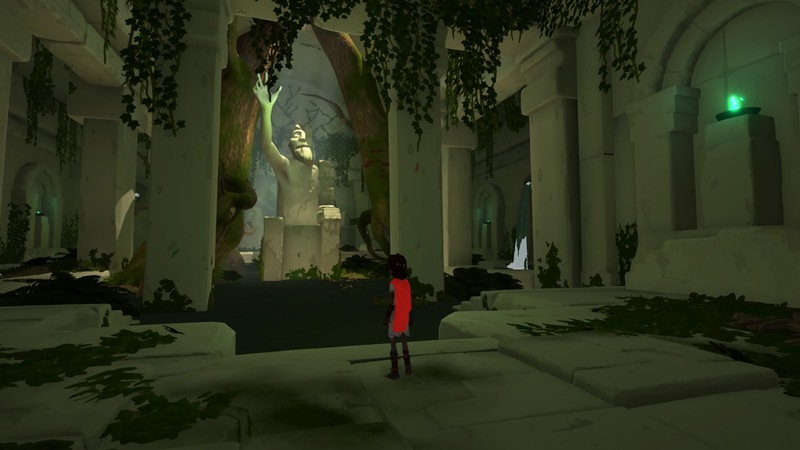 There's a bowl-headed statue inside - shout to ride to the second floor and use the keyhole device to finally bring one of the walkers to life. Go back down to meet your new walking friend. 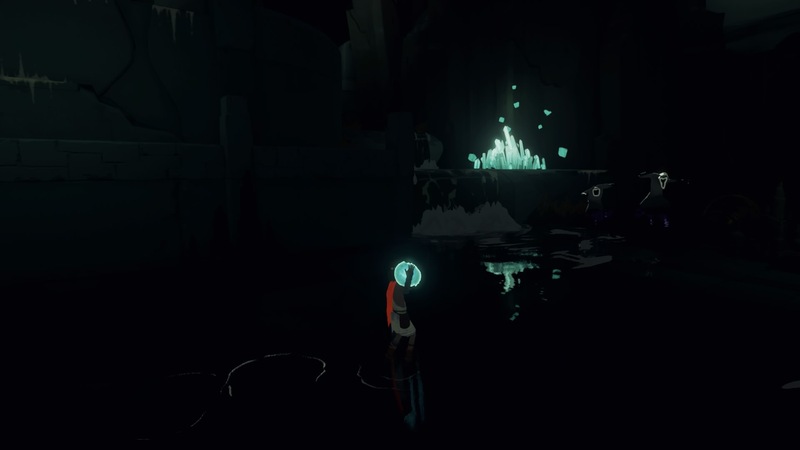 After the cutscene, go and grab a light orb from the generator, found to the right of the entrance door. Grab one, and then move the block off the glowing emblem opening the lift door. 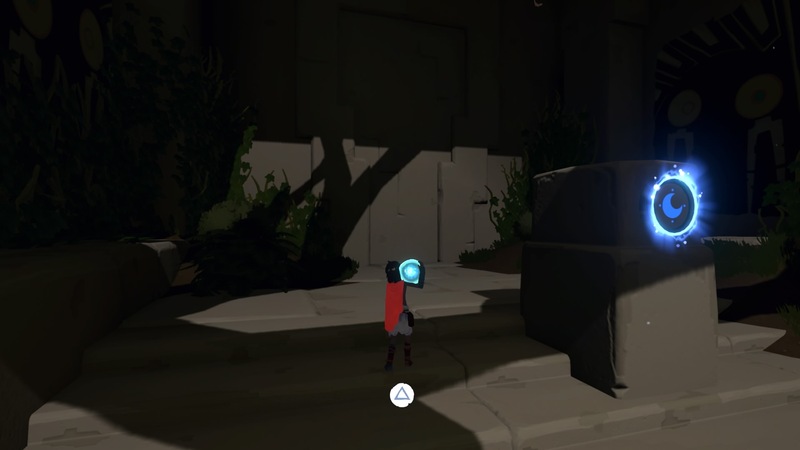 The goal here is this - you need to lead the sentinel to the first floor emblem, shout and activate the light orb to keep it still, then push the block into the lift. 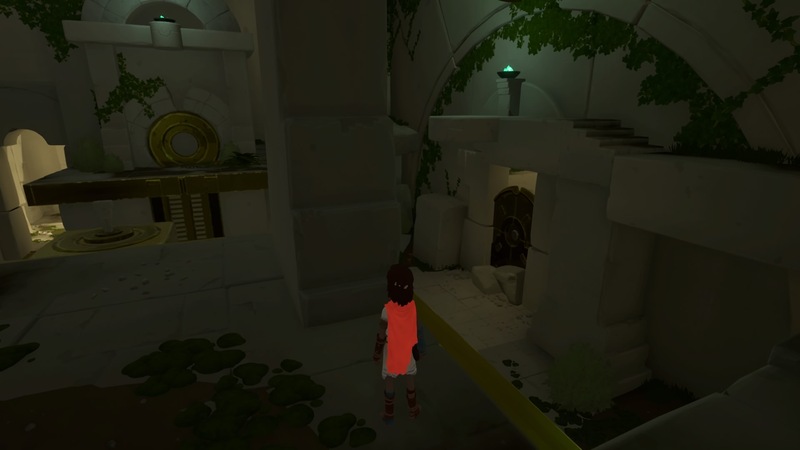 Go up to the second floor, and push the block onto the second floor emblem, opening the exit door and allowing you to continue on your journey. 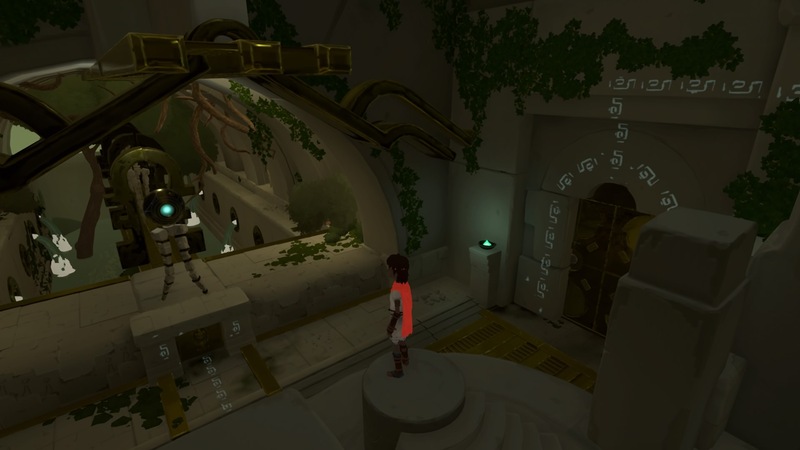 Past the bridge, use the crack in the wall and climb the ledge on the left to reach a turntable that opens the sentinel door, letting you buddy follow you. He'll break through the brambles - in the room ahead, follow him to the door on the right. The passage leads back to the north / south / east / west puzzle room. 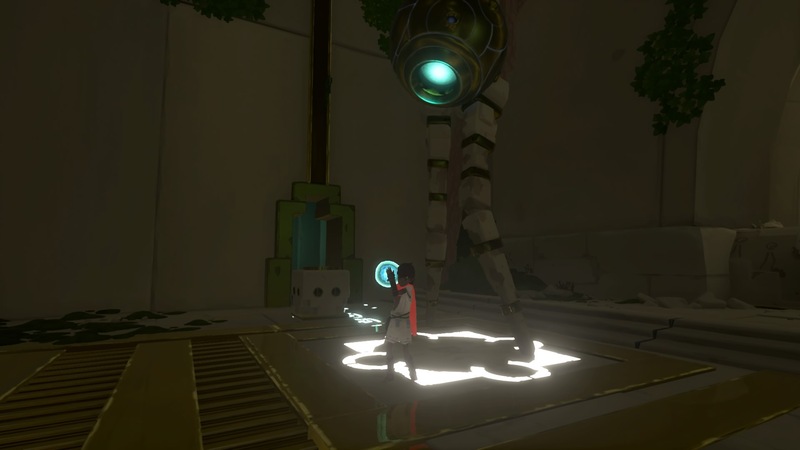 Returning to the S/N/W/E room, the sentinel will stand next to the southern (entrance) door. Lead the walker onto the emblem nearby to open the door to the lift room. Go inside and shout at the bowl-headed soul statue to ride up to the third floor. 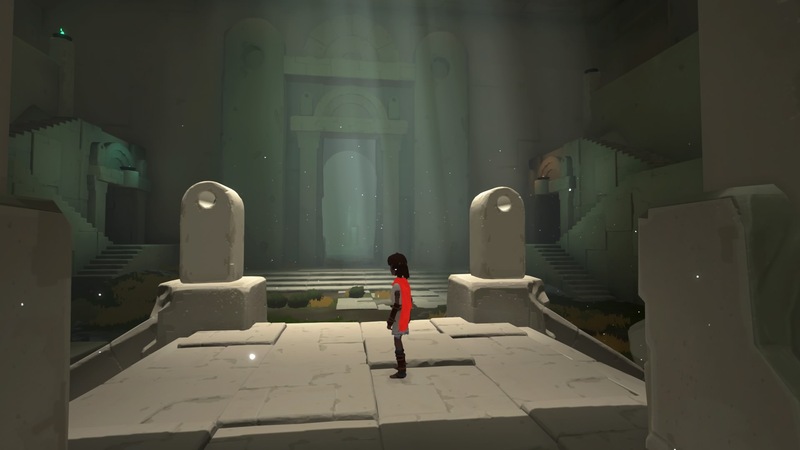 From the third floor, jump down onto the gold pillar and grab the light orb from the pedestal. 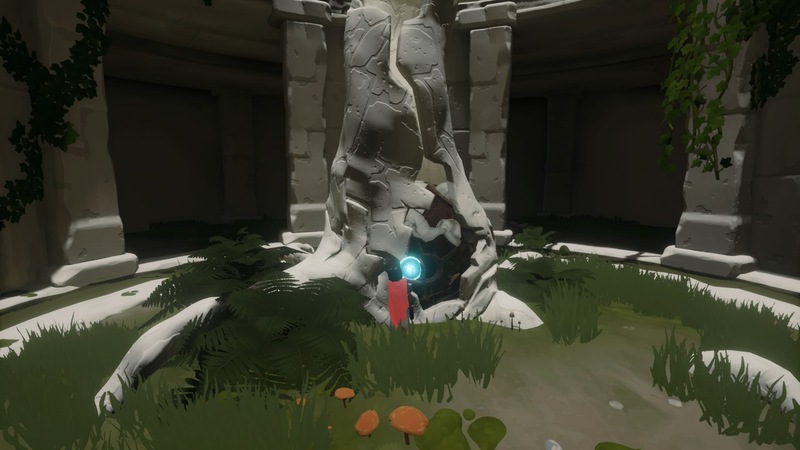 The pillar will lower, and you'll find your sentinel friend is surrounded by shades! Use the light orb to scare them off. 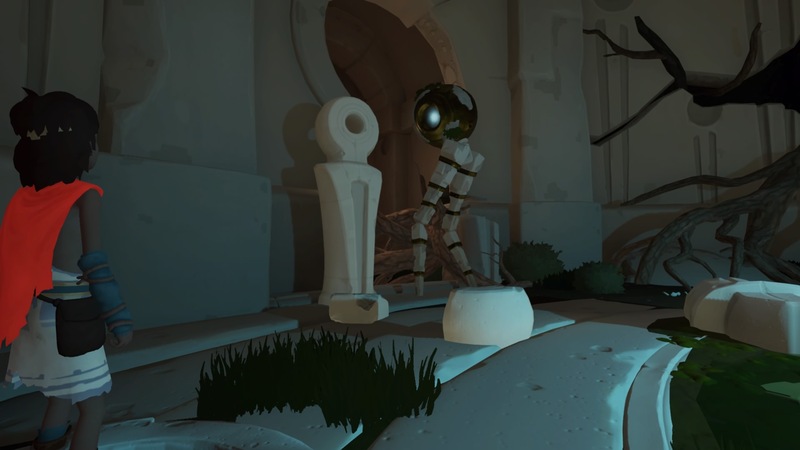 Grab another light orb from the fish-like statue and place it on the pedestal. The sentinel will wait near the door, then clear the brambles ahead. 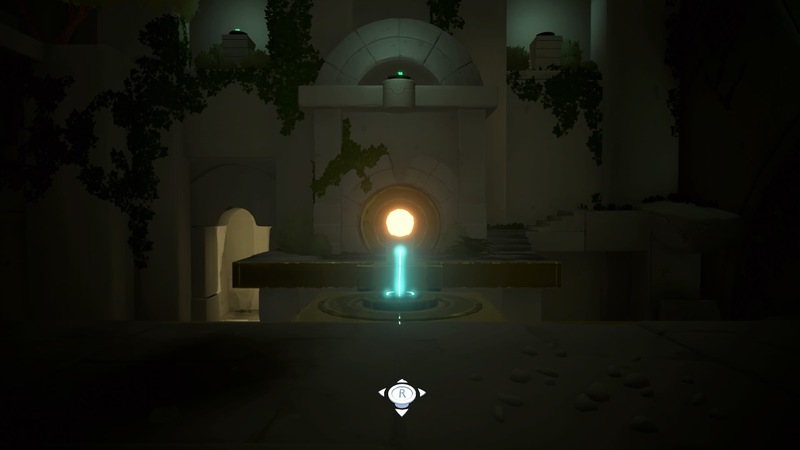 Follow the walker up the steps, using the side-stairs and ledges, until you return to one of the original core chambers. The sentinel will stand on the emblem and activate a lift. Stand on the circle and ride down, then follow the sentinel back to the fountain square where you'll meet up with the fox. 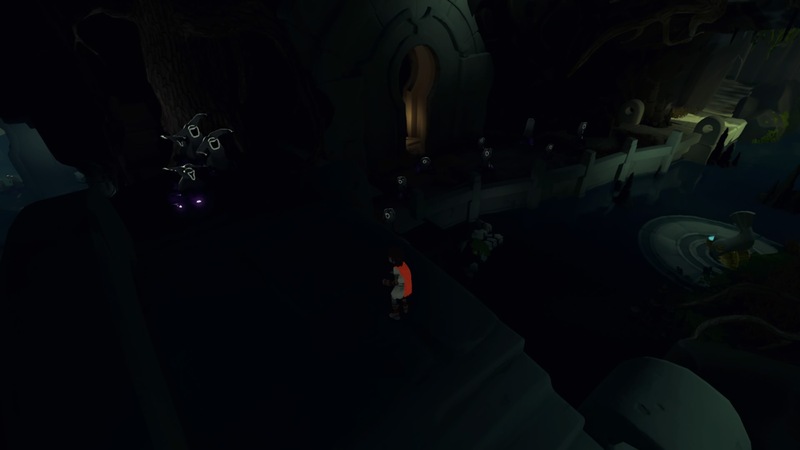 The sentinel will lead you back toward the dark cavern that was previously filled with shades. At the (back) entrance, the path forward is guarded by a swarm of shades. 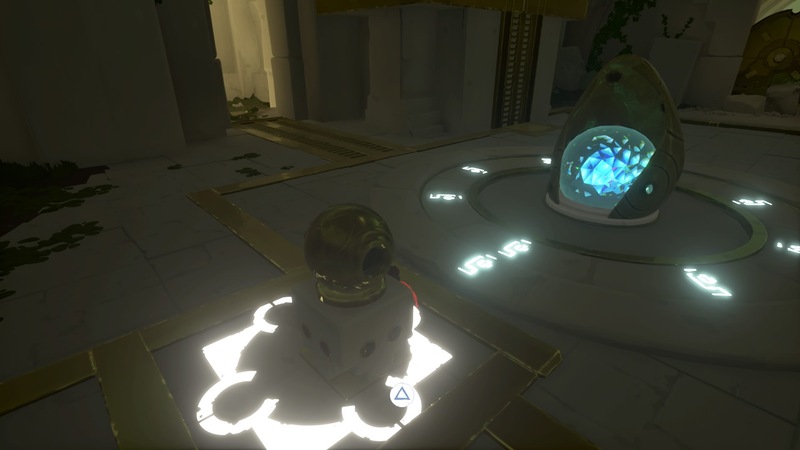 Unleash a light orb near the sentinel to amplify its power, vaporizing all the shades in the area. Two more walls of shades will try to stop your sentinel. 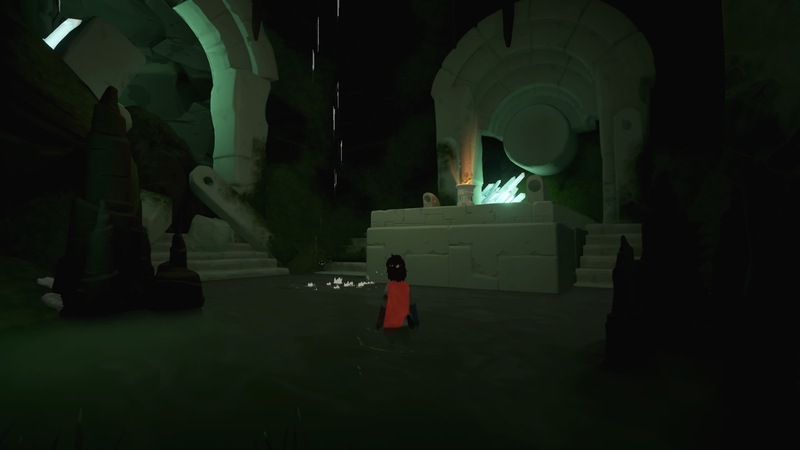 Grab the light orb at the top of the steps, past the first swarm, and drop down the waterfall steps to wipe out the second wave, then do it again at the doorway. That will clear all the enemies, letting your walker reach its final destination. Unfortunately, the sentinel gets upset when it finds a dead sentinel near the chapter's exit. Instead of helping, it stomps off down the steps toward the chamber full of derelict robots. 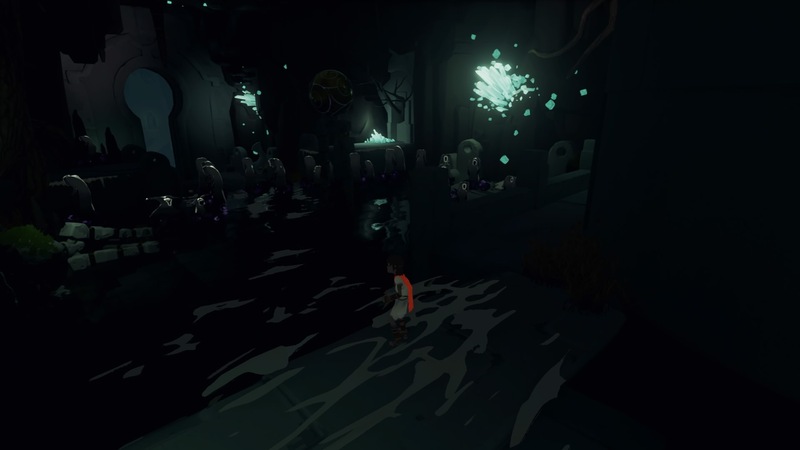 Your friend breaks through the partially broken wall and enters a catacomb puzzle chamber. The puzzle room is pretty complex. 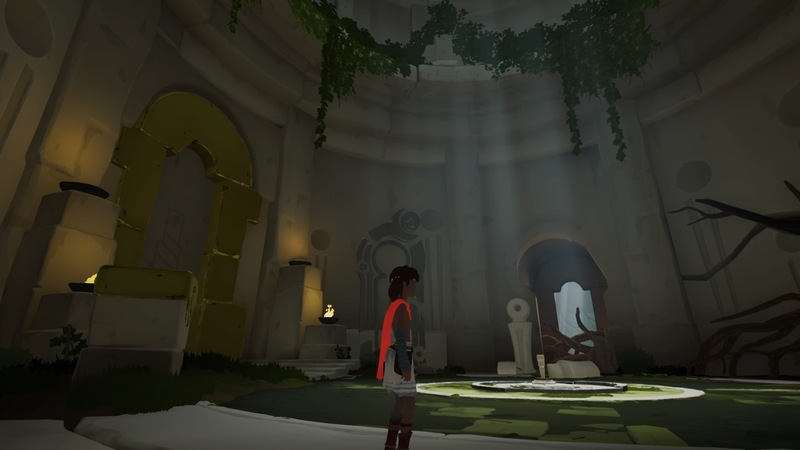 There are three emblems on the floor, and the sentinel naturally stands on the left one, making the bridge appear. 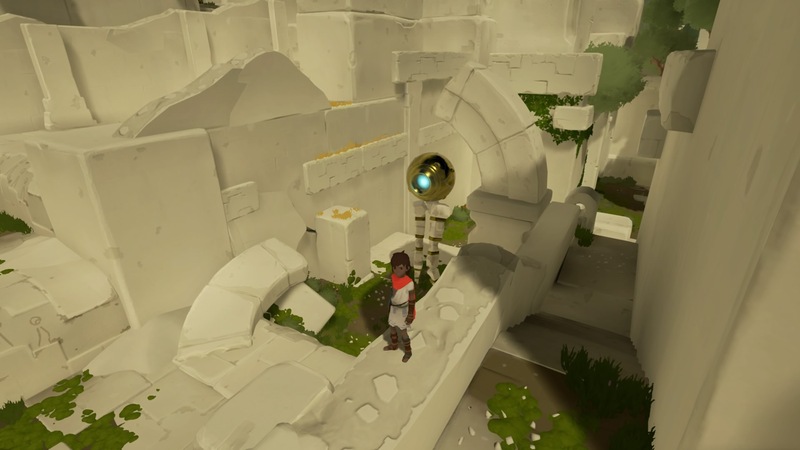 Grab a light orb and stand near the missing stairs or the right emblem. The walker will stand on it, allowing you to go up - then just wait and the walker will move to the left emblem, reactivating the bridge. 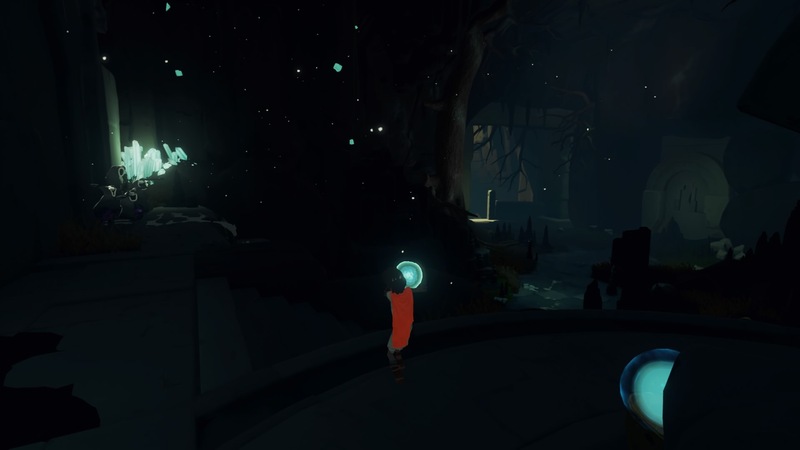 You can leave your light orb behind. Ahead, climb up the treacherous shaft until you reach a block. Take the block, and push it onto the back-center emblem - the column will move left toward the back-left stairs. 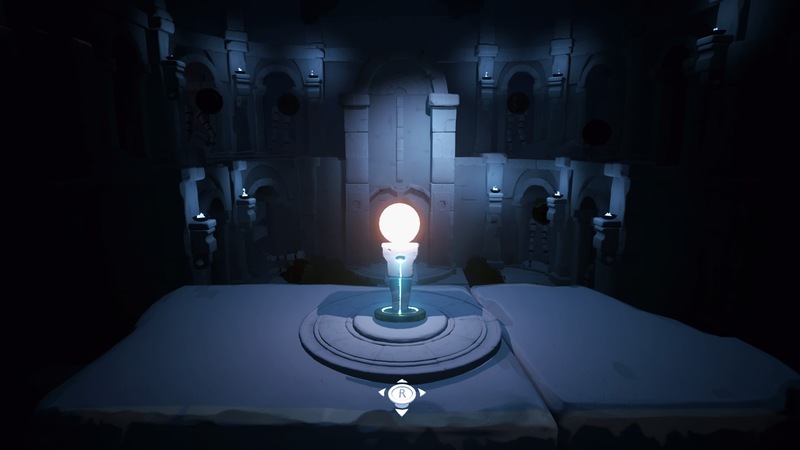 Use the stairs to reach the pedestal and place a light orb. When you're done, move the block to the front-right emblem, then go up and use the keyhole device. 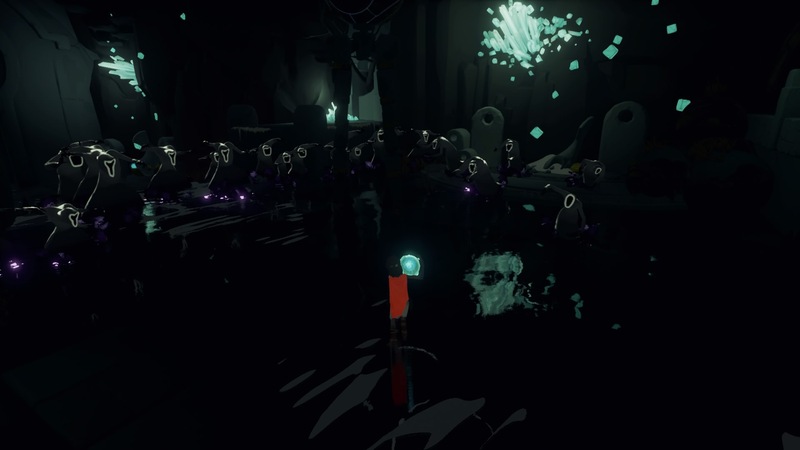 Align the light orb with the gold circle, then shout into the giant soul orb to bring back an army of walking sentinels! Now all you have to do is take the stairs back up to the room above. 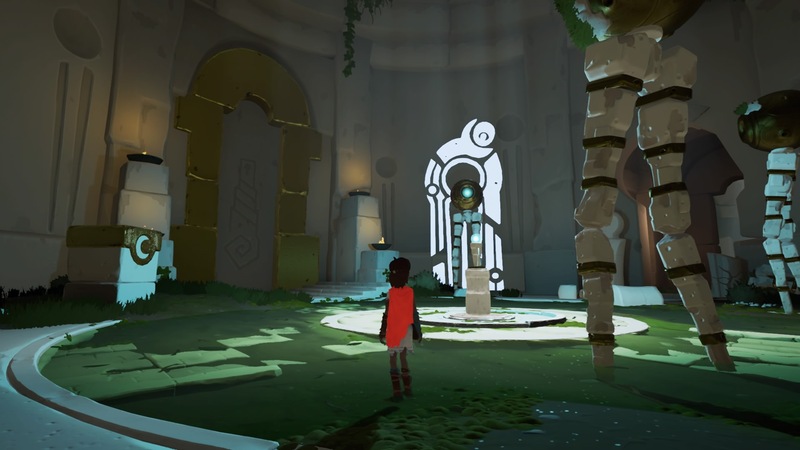 The sentinel is projecting its shadow - jump onto the smaller pillar to open the gold door and follow the sentinels as they march on through.